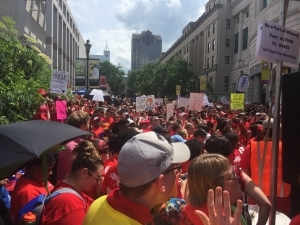 More than 19,000 teachers and supporters took over downtown Raleigh on May 16 to demand better pay for teachers and more funding for public schools. 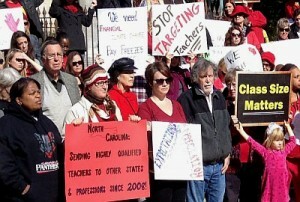 North Carolina’s Republican leadership appears to be swimming upstream, and largely alone, in opposition to the May 1 teacher march and rally. A new poll by Raleigh-based Public Policy Polling shows that more than 70 percent of the state’s voters – including more than half of Republicans — support teachers taking the day off to share concerns with lawmakers. Click here to see the entire survey. Republican leaders have been openly critical of the march. Sen. Phil Berger, (R-Rockingham), the Senate president pro tempore, has called the May 1 march a partisan ploy by the NCAE to help elect Democrats. State Superintendent Mark Johnson has also been critical. He asked teachers to consider a day in June when school is not in session. Forty-four percent of voters polled said they are Democrats while 35 percent said they are Republicans. Another 21 percent identified as other. The poll was conducted April 10-12. Eighty-five percent of voters who identified themselves as Democrats strongly support or somewhat support the May 1 march in Raleigh. And 55 percent of those who said they are Republicans strongly support or somewhat support the march. Meanwhile, 71 percent of voters who identified as other strongly support or somewhat support the teacher’s march. When voters were asked if they approve or disapprove of the job the Republican-led General Assembly is doing when it comes to education, only 33 percent of voters approved. Forty-nine percent disapproved and 18 percent were not sure. Gov. Roy Cooper fared better when asked about his job performance around education. Fifty-one percent of voters said they approve of the job Cooper is doing compared to 35 percent who did not. Fourteen percent were not sure. Sixty-nine percent (including 62 percent of Republicans) believe North Carolina teacher salaries are too low. 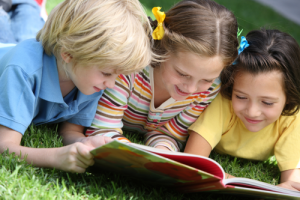 Seventy-seven percent (including 65 percent of Republicans) support providing enough school librarians, psychologists, social workers, counselors, nurses, and other health professionals to meet national standards. Seventy-one percent (including 56 percent of Republicans) support raising the minimum wage for school support employees like bus drivers, cafeteria workers and teacher assistants. Sixty-three percent (including 45 percent of Republicans) support raising state income taxes on the wealthiest 1 percent in order to increase public education funding. Last year, more than 19,000 teachers and supporters turned out for a march and rally for better teacher pay an increased K-12 funding. Additional funding to adequately staff schools with psychologists, social worker, nurses and librarians. 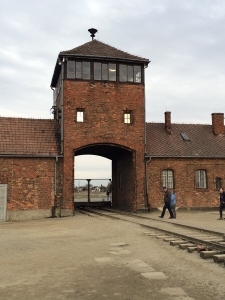 Students and chaperones from Durham’s Jordan High School took a tour of the Memorial and Museum Auschwitz-Birkenau in O?wi?cim, Poland during a Travel Club trip last April. The House has given a final nod to House Bill 437, which would require middle school-and high school-students to learn about the Holocaust and other genocides. Under HB 437, the State Board of Education would partner with the North Carolina Council on the Holocaust and the North Carolina Center for the Advancement of Teaching to integrate the study of the Holocaust and other genocides into English, social studies and other courses. The three bodies would also develop a curriculum for a Holocaust Studies elective for middle schools and high schools. Abramson was a Polish-born Holocaust survivor who, according to her obituary, “charged teachers and students across North Carolina not to hate” during school visits across the state. She died in 2011 at the age of 85. 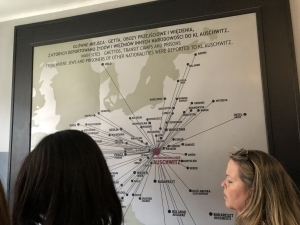 Students and chaperones from Durham’s Jordan High School view a map during a a tour of the Memorial and Museum Auschwitz-Birkenau in O?wi?cim, Poland during a Travel Club trip last spring. Leaders of the state’s Jewish community have lobbied for the bill. They explained to House members earlier this month why it’s important to remember the Holocaust. A bill to give teachers a 30 minute, duty-free lunch every day received a favorable hearing in the House K-12 Education Committee on Tuesday. The bill will now go to the House Rules Committee. Rep. Craig Horn, (R-Union), one of House Bill 563’s co-sponsors, said teachers could receive a much-needed break during the school day if the bill is approved. 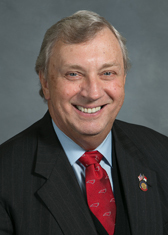 Horn, a co-chairman of the Education Committee, introduced the bill for primary sponsor Rep. John A. Torbett, a Gaston County Republican. Torbett attended Tuesday’s meeting but left for another engagement before HB 563 was discussed. Horn said HB 563 is needed because teachers get little alone time during the school day. “We ask so much of them and they get virtually no privacy from the moment they leave their house in the morning, their phone’s ringing, until they get back at night and their phone continues to ring,” Horn said. Although the bill was broadly supported, committee members had questions about language that appears to make the duty-free lunch optional for districts. They also noted that the bill had no funding attached, which could cost districts that abide by the law. “I don’t think any of us could disagree conceptually with the idea this bill represents, but I do have one question related to whether this is in the nature of an unfunded mandate,” said Rep. Hugh Blackwell, (R-Burke). 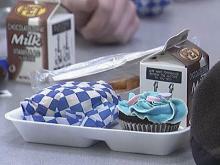 Blackwell said districts would have to hire someone to watch students while teachers eat lunch. No money has been committed to the bill, but committee staffers pledged to check for available funding. The state law that covers school improvement plans would be rewritten to include the 30 minute requirement for a duty-free lunch. The committee approved an amendment brought forth by Rep. Ashton Wheeler Clemmons, (D-Guilford), which mirrors language in state law governing teacher’s instructional planning time. “That’s the same language that holds us as school systems accountable for duty-free instructional planning, said Clemmons, adding that duty-free lunch should have the same expectation. Rep. Marvin W. Lucas, (D-Cumberland), said the language gives school districts wiggle room. Rep. Larry Potts, (R-Davidson), said HB 563 could place a burden on the state’s large school districts. “This could run into a lot money if everybody in instruction has to have a duty-free lunch,” Potts said. He said it will be difficult to support HB 563 without a plan to pay for it. Under House Bill 563, teachers would get a minimum of 30 minutes each day to eat without having to supervise students, perform other tasks such as lunch duty or attend required meetings. Ample time for a meal and lesson planning are real issues for teachers who often complain they don’t get enough time to do either during the course of a school day. Teachers say lunch and instructional planning time is often interrupted by meetings or is lost entirely when teachers must use planning periods to fill in for absent colleagues because substitutes aren’t available. Teachers responding to a social media query about where they currently receive 30 minutes for lunch shared varied experiences. While some teachers routinely get 30 minutes or more for lunch, others say they barely get a minute or two to “woof” down a meal. “We get 25 minutes duty free for lunch … but it came at the expense of our planning period being cut shorter,” Sherry Vestal, a Randolph County teacher, wrote on the North Carolina Teachers United Facebook page. 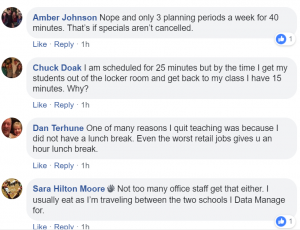 The social media query by N.C. Policy Watch prompted nearly 400 comments, which shows how strongly teachers feel about receiving a lunch break during the school day. Katherine Victoria, a former Transylvania County Schools teacher now working in Roseburg, Oregon, said teachers in Oregon receive 40 minute, duty-free lunches. “I left NC for a unionized state and the grass is GREENER! 40 min duty free lunch is part of my contract. It’s never been taken, but if it were, I’d be paid (what is equivalent to) my hourly rate at time and a HALF,” Victoria wrote on the North Carolina Teachers United Facebook page. When asked who watches students during lunch by a North Carolina educator, Victoria said aids and assistants serve as lunchroom monitors. She said aids and assistants are pulled from kindergarten, first-grade and interventions to monitor the cafeteria and playground. “Lunch and recess happen consecutively, 20 min each to allow for our 40 min lunch break,” Victoria wrote. A bill filed this month in the House would require North Carolina teachers to receive 30 minutes of “duty-free” time each day to eat lunch. The state law that covers school improvement plans would be rewritten to include the 30 minutes for a duty-free lunch. John A. Torbett, (R) Gaston is the bill’s primary sponsor. He could not be reached for comment Monday afternoon. The House Committee on K-12 Education is expected to take up HB 563 on Tuesday. Teachers say lunch and instructional planning time is often interrupted by required meetings or is lost entirely when teachers must use planning periods to fill in for absent colleagues because substitutes aren’t available. Teachers responding to a social media query shared varied experiences when it came to lunches and planning time. While some teachers routinely already get 30 minutes or more for lunch, others say they barely get a minute or two to “woof” down lunch.